Creativity is perhaps one of the most important tools of the artist. The artist is constantly making decisions about the work as it progresses. Creativity is the fuel that feeds those decisions. Without it, the artist may become "stuck", unable to discern the necessary steps to move forward. This is true in any work - even it is created purely from observation. Creativity is like a muscle. If it doesn't get worked, it weakens and begins to atrophy. The artist should devote a bit of their work each week (or day) to strengthening their creativity. By working those "creative muscles", the decision-making process becomes intuitive. The work starts to flow. Like any muscle, your creativity grows through exercise. The more that you put it to work, the stronger it will become. You may not notice it immediately, but with practice (exercise), you'll start to recognize the benefits in your representational work. In order to strengthen your creativity, you must create some limitations. There has to be a challenge. The challenge can often be the limitations. Creativity steps in when we present a solution within the limitations. Of course, there are inherent limitations is every work that you create, but if we are to "exercise" - then we need to impose our own. This means that we need to create some "boundaries" to work within. This can be accomplished with any medium. You can limit the size, the colors, the time spent on the work, and so on. However, some mediums lend them self to more "concrete" limitations (and opportunities). "The Pen and Ink Experience" is a comprehensive drawing course designed to guide absolute beginners to a level of producing professional quality pen and ink drawings. Ink is a unique medium for creative problem solving. Because it is permanent, we have to be deliberate with marks and allow our "mistakes" to show through. However, it is fluid and suggestive, giving our creativity room to "blossom". 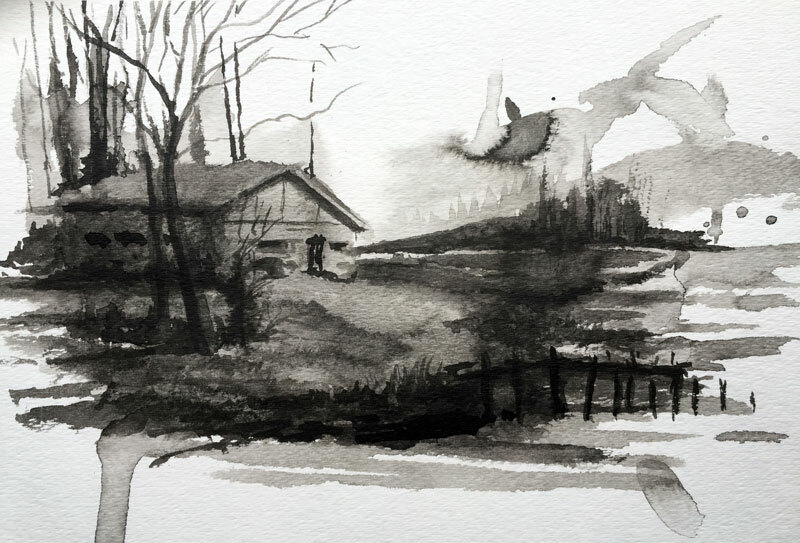 A simple and quick creativity exercise is to use ink wash to develop a scene from our "mind's eye". We'll need to create limitations, so we'll start without any idea in mind and let the ink "speak" to our creative nature. To give ourselves a "starting point", we'll spread a fluid pattern on the surface, examine it, and then let our creativity take over. We'll start with a blank sheet of 140 lb. cold press watercolor paper. A liberal amount of water is added to the surface with a hake brush. A defined shape of water is created, so water is not applied to the entire surface. The brush is then dipped into the pure ink and applied by touching the water shape. The ink will flow to form interesting patterns and shapes of value. We can manipulate the shape by adding additional applications of ink and water. As the ink begins to dry, we can examine the shape and develop a subject from the values and shapes. Go quickly and trust your first instinct. In this case, I see a landscape initially, so I start to develop it using the brush. A few marks are added for the water, trees, and the beginnings of a cabin. The ink is allowed to spread and the marks are quick and loose. To add details, a smaller round brush is used. Progressively, applications become a bit more concentrated with ink, using less water. A few plants, a couple of trees, and a small broken prier are added. As the ink dries, it becomes a bit lighter. You may find that you need to revisit a few areas to create the necessary darker values. A few last details are added to further enhance the illusion of space. This exercise took less than fifteen minutes to complete. Spending just a few minutes each week strengthening your creativity will produce noticeable results in the art that you create.